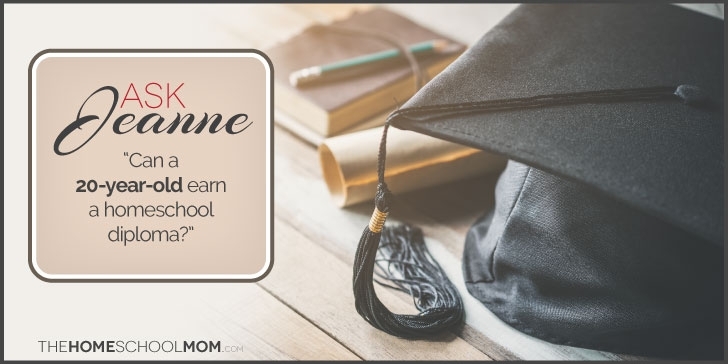 You are here: Home / Blog / Ask Jeanne / Ask Jeanne: Can a 20-Year-Old Earn a Homeschool Diploma? Homeschooling when a person is past the traditional age of school attendance is not common, but I don’t know of any upper age restrictions. In most states, including North Carolina, when you graduate from homeschooling, your parents issue you a diploma, and the state does not issue a diploma. Parents decide what the graduation requirements are and when their child has met them. Parents provide a homeschool transcript showing completed studies. You might more commonly hear studying for a high school diploma at an older-than-typical age referred to as “adult education” rather than homeschooling. In many countries and in all states in the United States, homeschooling occurs in a legal context made up of three main parts: compulsory attendance laws, the right to a free public education, and homeschool laws. Compulsory attendance laws. Compulsory attendance laws govern the ages that children are required to be in school. Various states in the U.S. have set age 16, age 17, or age 18 as the age at which you are allowed to stop school attendance; otherwise, you’re compelled to be there until you reach that age. Right to a free public education. Likewise, states have different maximum age limits for which they must offer public education at no cost to the individual child or family. Free public education is commonly available up to age 20 or 21, with a few outlier states only making it officially available to age 17, and some others making some form of public ed available all the way to age 22. Check out the National Center for Education Statistics’ easy-to-read chart of U.S. states age requirements for school attendance and free public education, as well as various special circumstances. Homeschool laws. Complying with homeschool laws, which also vary state-to-state, may be generally thought of as a way to meet a state’s compulsory attendance law without actually attending a public school. Within this legal context, some people see “official homeschooling” as taking place during the ages of compulsory attendance while others see it as taking place during the ages a person is entitled to free public school. A 20-year-old would have aged out of the compulsory attendance years, but in many states would still be entitled to free public school. Public school norms. The upper age of homeschooling is often thought of in the social context of the age for “usual” school attendance and graduation. Most 18-year-olds in the U.S. are seniors who graduate at that age, but there are a lot of 19-year-olds who are still in school, as well. This is pretty common due to red-shirting, which is intentionally holding children back in school, often to give them time to grow academically (as in a 5-year-old who is not ready for kindergarten until age 6), but also sometimes because parents want to bestow a physical advantage on a child they believe may be an outstanding athlete. It’s also not uncommon for a child who had difficulty in school to be held back a year. Homeschool norms. As I explained, in many states, homeschoolers don’t have state graduation requirements and can graduate when their parents deem them to be ready. This often means fulfilling the requirements for a transcript that would help a child get into college, trade school, the military, or a vocation. While it is sometimes even younger, a fair number of homeschoolers graduate at 16; more commonly, they are on track to graduate at 18 like their schooled peers. At the same time, many homeschoolers take an extra year for high school, finishing at 19, again, like many peers in school. no one bats an eye. A 20-year-old would be just beyond that really common age of “still being in school” when he got started homeschooling; if it took him a year or more, he would be older than typical, but still not by that much. Homeschoolers have a lot of flexibility in the age of graduation, with most people graduated by their parents when they are between the ages of 16 and 19. We’ve already seen that there are both school students and homeschoolers who are over 18 and still working on their high school diplomas. I can find no upward limits on age for homeschooling, although public schools may not typically admit students over certain ages for social reasons. If state law requires public schools to provide education up to age 20 or 21, they may provide alternatives rather than attendance at a typical high school. Students who are 19 but have grown up attending public school on a certain pace will seem like their classmates despite being older than many of them. Schools may not want to introduce “new” 20-year-olds to a school because most of the other students at the school would be minors (under 18). However, this isn’t applicable to people learning at home. In fact, there are online educational service providers (virtual schools, correspondence schools, distance learning schools) whose main business is with traditional-age high school students, but they provide adult education programs leading to a high school diploma as well. Since many homeschoolers learn at home and receive diplomas without such programs when they are 18 or younger, I can’t see any reason why being 20 would suddenly make a difference. Legitimacy. The challenge is that receiving a homeschool high school diploma at an older age may be questioned more by potential employers or colleges. Many won’t put together the birth date and the graduation date, but some might. There is a high demand for “legitimate” homeschoolers in the workplace and in higher education, but a lot of that is based on the reputation of long-term homeschoolers who grew up in family-based education over many years. Some employers, and even some homeschoolers, worry that some people might try to “look like” homeschoolers. They might think that “catching up” on missed high school credits by homeschooling as an adult is not the same learning experience. Competency. That said, the important thing is to be able to “signal” to others that you are competent. Through independent homeschooling or by using one of the adult education programs, your friend’s son can receive a high school diploma. He may need to do additional things to “signal” his competence and that his education has prepared him for next steps of living and learning. There are other private schools that offer high school diplomas to adults (some with more traditional course work), or, if Wes and I are right, a person can independently homeschool his way to a diploma at age 20, without a “program” or private school. The GED is often presented as the only alternative to earning a high school diploma by age 18 or 19, but that’s not the case. Disruption of educational norms. Of course, this notion shakes up educational possibilities. If you can homeschool at 20 and get a diploma, what about at 21? At 25? At 57? Maybe you can homeschool yourself as an adult and grant yourself a diploma? This both makes no sense and perfect sense, depending on what you think about educational credentials. The book College Without High School (affiliate link) will open your eyes further about these possibilities. It’s written by Blake Boles, who regularly helps teens and young adults get out there learning, earning, making their way in life without a traditional education. Thank you for your insights on homeschooling adults. I’ve been told it’s legal but not common. This could give hope to.adults who didn’t finish high school but have the skills and experience needed for graduation. You’re welcome, Jim. Thanks for letting us know you appreciated our article. It’s an option worth exploring for adults who didn’t finish high school, so I do hope it can provide encouragement. I’d like to add that many community colleges have essentially open enrollment and can be a good option for furthering education for those who can afford it.